Thus far in our series The Golden Rule of Content Marketing (70-20-10), we have covered the most efficient and productive way to curate 70% of your content and how to promote yourself without actually promoting yourself; now, we will focus on the last 10% of your content marketing strategy dedicated to the ‘personal flair’ that gives personality to your brand. Personality and everyday vernacular are essential aspects of a successful marketing strategy. Marketing has evolved from the firmly established dichotomy between B2C and B2B to a natural and engaging form of Human to Human marketing. This makes your business’ ‘personal flair’ all the more important (to read more about H2H, read our blog The Anatomy of Emotional Marketing). Consumers no longer want to be told what to buy, they want to have conversations with businesses about how your product will change their lives for the better. This is when your personality comes into play. When businesses try to sell us something (excessive phone calls or the obnoxious, repetitive emails) our first instinct is to get defensive; we want to choose our purchases rather than feel pressured to make a purchase. 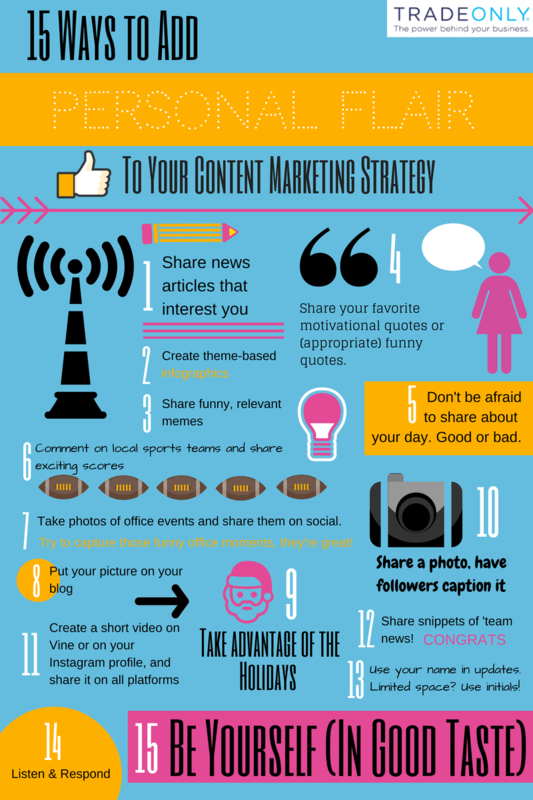 To review the last 10% of your content marketing strategy, I have created an infographic featuring 15 ways to personalize your content, so you will never run out of content ideas! Save this infographic to your desktop and feel free to share with your marketing friends who need a bit more personality and a little less ‘sales pitch’.